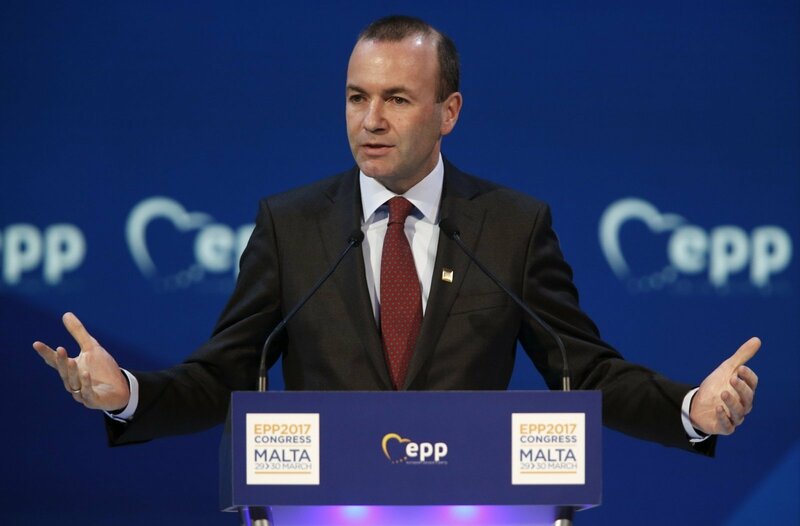 Manfred Weber, leader of the European Parliament's largest political group, says that Lithuania should choose Europe amid recent tensions between the European Union and the United States. "I think there is only one way to do so -- to choose Europe. That is the only way to keep European unity, because it is the only way to survive as Europeans in a global world of challenges we are facing today," the German politician, who visited Vilnius last week, told BNS in an interview. The EU is still waiting for the US to guarantee that it will not impose tariffs on European steel and aluminum. The bloc does not support President Donald Trump's decision to move the US embassy in Israel to Jerusalem. Washington last year announced its withdrawal from the 2015 Paris climate agreement and said in May that it was pulling out from the Iran nuclear deal. Weber said that "we, as Europeans, should not only swallow what he (Trump) is offering us". "We have to be independent. We have to be convinced about our position. There is a European way of life and European understanding of things," he said. As discussions about the EU's new multiannual budget are getting underway, the leader of the European People's Party group in the European Parliament said that Lithuania should continue to receive money from the Cohesion Fund aimed at reducing disparities between member states. He said that the bloc must invest in the creation of highly-skilled jobs in an effort to curb emigration from from Lithuania. The German politician also said that the Nord Stream 2 gas pipeline should not be built as it would increase Europe's dependence on Russian gas. BNS: Lithuania seeks convergence of direct payments to farmers in the EU. What do you think of that idea? Weber: I think we have to continue the path of equal treatment of farmers in the European Union. For us this proposal from the European Commission is a good starting point, we don't support it fully at the moment, but it is a good starting point for a discussion. And we must face that we are losing a lot of money due to Brexit, but the tasks are getting even bigger, so border protection is needed, more investment in research, we have to do more on Africa. BNS: So do you think that these payments should be equal in the upcoming budget? Weber: That is up to the decision process ahead of us, so for the moment we are using that the position of the European Commission is a good starting point. But can I confirm that a direction is important, that we will treat farmers in the future equally. Everything depends on money, I have to say, because if member states are not ready to give Brussels enough money, we cannot finance all the demands which are on a table. That is why it is not easy to confirm this. The European Parliament is looking for sufficient financing of the EU and that means that members states must be ready to contribute to the EU budget. BNS: Do you think Lithuania is still a country that needs cohesion money? Weber: Absolutely. Lithuania is a country that has shown that money gives a positive outcome here; the investment and infrastructure were properly managed and it really contributed to GDP development and positive economic development. On the other hand, if you are getting stronger economically, you are losing money, that is a reality we have to face. However, there is still a need of investment, a lot of people are still leaving the country, it is obvious that there is a need for further investment to establish high skill jobs. There is one thing we should take into account. The European Commission next week will come up with a proposal about the new criteria regarding the distribution of some money between the countries. And I think, in the Lithuanian case, we have to take into account that the GDP per capita idea is not a correct approach, because a lot of people left the country in the last couple of years. That statistically makes GDP per capita bigger, but this does not have a proper impact on reality. That is why we have to take statistic problems into account. BNS: Lithuania and Estonia disagree on how the Baltic power grids should be synchronized with the Western European network. Lithuanian Prime Minister Saulius Skvernelis does not rule out Lithuania and Poland carrying out the project without the other two Baltic countries. Can this affect decisions on the allocation of EU funds to the synchronization project? Weber: There is money for interconnecting the European Union on the table and I can say that there is much more demand in Europe for investments than money on the table. So if the Baltic states cannot agree how to deal with the issues, then others will get the money. BNS: There are rising tensions in the EU and US relations. Since the US is taking a more hawkish stance on most foreign policy-related issues and is withdrawing from agreements that the international community considers important, what can countries like Lithuania do, does Lithuania face a need to choose strategic partners? Weber: I think there is only one way to do so -- to choose Europe. That is the only way to keep European unity, because it is the only way to survive as Europeans in a global world of challenges we are facing today. Again, Americans are our friends, we have common understanding on democracy, rule of law and freedom, but we have a president with a new political approach, a new style of doing politics. First, we have to respect this, because he was elected, but on the other hand, we, as Europeans, should not only swallow what he is offering us. We have to be independent; we have to be convinced about our position. There is a European way of life and European understanding of things. We believe that there is a need to balance the economy with the social market economy; we say that we need an environmental protection, I mean the Paris agreement. We believe that in the field of Iran, we should solve the risky disputes through diplomacy, treaties and not through military activities. This is in what we believe and we have to defend and we can only defend it together. I think there isn't any other option but to stay together. BNS: Do you think that the US current policy is dividing Europe? Weber: Well, a lot of powers at the global level have an interest in a weak Europe. First of all, I would like to mention Putin. He is using all of our internal problems, like Brexit, in the Catalan case, national elections -- he is using everything to split up Europe, because he is stronger when we are not united. Others as well. China also wants to split up Europe. BNS: Are you saying that the US is doing the same right now? Weber: The US, first of all, are defending their own interests and we have to give a proper European answer to that. Nobody alone, even Germany, can compete with America, China or Russia. Only together we are strong enough to defend our interests. BNS: What sort of answer are you speaking of? How to react to possible tariffs on steel and aluminum, for example? Weber: First of all, there is no reason to implement any tariffs on European steel and aluminum. BNS: But I am speaking more generally. Is it an eye for an eye or some other answers? Weber: Eye for an eye, because it is a proper action. If America is imposing tariffs on our aluminum and steel, Europe has to react. The appropriate measures are on the table in Brussels and we are discussing them, but we should react on the basis of international trade agreements. Even though Trump can break them, we have to stick to the rules. BNS: What do you think of the EU enlargement policy? Weber: The key question at the moment is the Western Balkan countries. There we have absolutely clearly European countries which must have European perspective. Last week's summit in Sofia was a great step forward and now it is up to these countries to do the necessary steps. The readiness from Europe is there, but they have to deliver. What we believe is that in this discussion about the EU enlargement process, we also need to have a discussion about the final composition of the EU. People from Europe are seeing the EU enlargement process as an endless process, so where do we see the end of this European enlargement? For example, we need to make it clear that Turkey cannot become a member of the EU. We need to say that there is an end to our borders as Europeans. Weber: There are also six countries in the EU Eastern Partnership program. Some of these countries do want to become members and some of them do not. Lithuanian authorities support EU integration when we speak of the Western Balkans, but they urge the EU to be fair, because there are also Ukraine and Georgia, which are also carrying out reforms and waiting for EU membership perspective proposals. Do you think it is fair to ask for that? Weber: For the countries you mentioned, I think we have a clear pro-European perspective for them. For example, the decision to give visa free travel to Ukraine and Georgia was a big step to show the readiness of the fair treatment of the citizens of Georgia and Ukraine. But having in mind the war in Eastern Ukraine and the instable situation in parts of Georgia, we cannot talk about an enlargement process at the moment. There is a task to stabilize the countries and there is a task for Europe to show readiness to assist all the forces that want to go in the Western way, in a democratic way. BNS: Since you are not only a EU politician, but a German politician as well, I want to ask your opinion on Nord Stream 2. Weber: I think Nord Stream 2 is not an economic project; it is a political project. The dependence of Europe on gas deliveries from Russia will increase and that is why I think it is not wise to do Nord Stream 2. I am asking the German government to show the readiness to discuss Nord Stream 2 at a European level, because it is not only a domestic decision. The Commission has put on the table some legal proposals to allow the EU institutions to get involved in the decision-making process and I hope we have in the Council enough readiness to go through this step. Žygimantas Pavilionis. Emanuelis Zingeris. Fourteen years in EU foreign policy: what are the achievements?